This is a collection of the best riddles and brain teasers (with answers) that I know of. To get the latest additions each month, join the mailing list and I will send you an email each month. Riddles and brain teasers are an entertaining way to give your brain a workout and to improve your critical thinking skills. They’re also a fun distraction from the daily grind. And if you’re preparing for a job interview, knowing some of these can be a big help. For some reason employers think if you know how to solve riddles, brain teasers and other puzzles it means you’ll be an ideal employee. The riddles and brain teasers are separated into their respective categories and in both cases you can use the Show the answer link to reveal the answer. I recommend you try to figure it out on your own first, otherwise your brain won’t get much exercise. Once you’ve revealed the answer you can rate the riddle or brain teaser from 1 – 5 stars and add your own comments or questions. If you have a riddle or brain teaser to share, please send them in. I look forward to hearing from you! This site was created by Dan Hersam. In the early 1990s I started gathering riddles and brain teasers that I liked on my web page. Over the years the list has grown from either people like you sending them in or adding ones I’ve written. In 2013 I decided to move all of the riddles and brain teasers to their very own site, RiddlesBrainTeasers.com or RBT for short, which is pronounced like a frog’s ribbit. And that’s where you are now. Even after almost twenty years of collecting them, I still love solving a good riddle or brain teaser. My definition of good is one that has a single answer that makes sense when you hear it. I’m not a huge fan of what I call groaners, or riddles that are really jokes. They’re fine for what they are, but I don’t want to spend an hour or two trying to figure it out, only to be told an answer that I could never have guessed. I’m always looking for more riddles or brain teasers to add. If you have one, please send it in. I don’t have any pictures of me solving riddles or brain teasers. 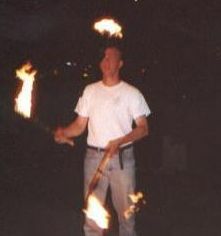 It wouldn’t be very entertaining anyway, so instead you get a picture of me in college, juggling flaming torches. Interestingly enough, the real danger wasn’t the flame, but burning hot lighter fluid flying off the end of the torch and hitting your face. Man that sizzled.